The new HANSATON X-Micro is a companion for style-conscious newcomers and for hearing system wearers who wish to keep their hearing loss private. It has fancy accents such as the user-friendly, diamond-shaped program pushbutton. This hearing system is available in seven color variations. 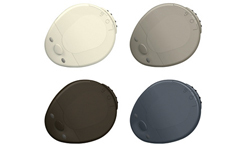 Thanks to the interchangeable shell concept, individual color combinations can also be assembled. With its new XearA technology, this tiny hearing system offers technological innovations that guarantee sound quality and hearing comfort. It also offers optimized speech detection and suppression of interfering noise. With its Natural Sound, the user can enjoy an especially natural sound quality. Thanks to its acoustic feedback system, disruptive feedback is also a thing of the past. 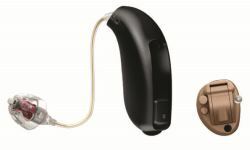 Starkey introduced its new tinnitus treatment solution and two new members to its wireless family. Distributed under the Starkey brand name, Xino™ Tinnitus combines advanced hearing aid technology designed to provide personalized tinnitus relief. 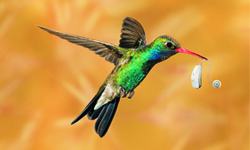 Xino Wireless includes the new micro RIC 312 that offers the benefits of Starkey’s IRIS™ Technology. The "best-fit" tinnitus algorithm sets the tinnitus stimulus according to the patient's audiogram, but also, 16 bands of frequency adjustments and a novel modulation algorithm make it easy to shape the stimulus to fit the patient's unique tinnitus experience. Finally, Starkey says SoundPoint Tinnitus allows patients to become active partners in fine-tuning relief to their precise preferences, which helps ensure greater success. Hearing-aided people can use an iPhone to control their hearing aids in a manner that is elegant, intuitive, and absolutely discreet. ReSound Control is a free download on the App Store which extends and enhances the use of the ReSound Unite Phone Clip+. 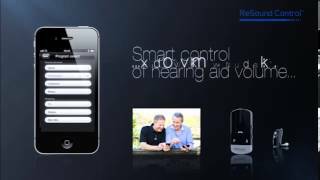 Users can control their hearing aids, phone conversations and wireless streaming accessories from their iPhone screen. Soon to be available for AndroidTM smartphones as well. The trademarks listed are owned and used by The GN ReSound Group and its related affiliates. Apple, iPhone and iPod Touch are trademarks of Apple, Inc, registered in the US and other countries. App Store is a service mark of Apple, Inc. Android is a trademark of Google, Inc. Bluetooth is a trademark of Bluetooth SIG, Inc.
MED-EL announces the CE Mark and FDA approvals of the RONDO Single-Unit Processor for cochlear implants. This new, compact audio processor design combines the coil, control unit, and battery pack into a single device that is worn off the ear. Full market availability of the RONDO is expected in Spring of 2013. RONDO is based on the OPUS audio processor platform, and features the same signature technologies, Automatic Sound Management and FineHearing. 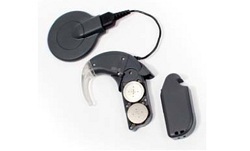 It may be worn by all users of MED-EL cochlear implants and includes the FineTuner remote control unit. With premium hearing technology and innovative fitting tools, Oticon Alta empowers hearing care professionals to provide hearing solutions that are as unique and individual as their clients.Alta is built on Oticon’s new Inium signal processing platform. Inium’s extended working memory facilitates power-efficient wireless binaural processing that enables the exchange of sound information between both ears for a more natural, authentic sound experience. Inium’s ability to deliver enhanced speech understanding, improved sound quality and more effortless listening supports a wide range of personalisation opportunities. Alta also features new Speech Guard E, which preserves more speech cues for better performance in difficult listening situations. 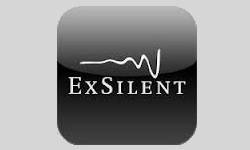 To give everyone the opportunity to find out in what way the amplification of environmental sounds can improve the quality of everyday life, ExSilent offers an amplification app, the HearYouNow app. November 1st 2012 the HearYouNow app will be available in the app store for free. It uses the iPhone microphone and produces an amplified sound via the headphones. With this app, you can customize the sound performance, depending on different listening environments. Know more on booth #1777 at Audiology Now in Anaheim! The new version of the two-step (OAE/ABR) Newborn Hearing Screener is fast, accurate and intuitive, and builds on Otometrics’ reputation of having one of the most trusted newborn hearing screeners. One of the major improvements with the new MADSEN AccuScreen is its touch screen. Seen from a workflow point of view the touch screen requires only a few screen clicks to e.g. switch between screens, enter a new patient, start tests and validate cable and probe functionality. Great benefits of the new AccuScreen are the size and weight of the device. It is smaller and lighter than its predecessor and almost all other devices available in the market. When screening babies all day, users will benefit greatly from working with the AccuScreen. A tiny new hearing instrument may make it easier for people with a strong preference for an “invisible” hearing solution to take the first step toward better hearing. Designed specifically for people new to hearing instruments, Oticon Intigai is an “out of sight, out of mind” hearing solution that hides comfortably in the ear canal and enables new users to experience the benefits of better hearing right away. 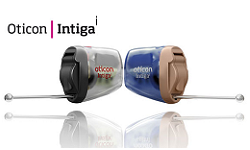 Housed in Intigai’s tiny shell are a number of premium audiological features also found in the original Intiga, a family of hearing solutions that has been proven in an international clinical study to deliver immediate benefits and immediate acceptance for people new to hearing instruments (Behrens et al., 2011). Invisible-in-the-ear Intigai’s high-speed sound processing provides access to vital speech cues to improve speech intelligibility and reduce listening effort. Enjoy the same great OPUS 2 hearing experience: now available in size extra small. 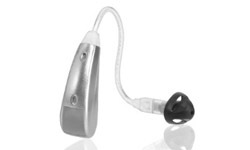 The OPUS 2XS is designed for implant users who need smaller ear-level processors especially children. Light and thin, the OPUS 2XS fits snugly on the ear. Small dimensions and a shorter battery pack provide increased balance for increased wearing comfort. The new OPUS 2XS is the ideal choice for children because its enhanced insulation makes it extra resistant to dirt, dust and sweat. Developed for small ears, the OPUS 2XS is 10mm shorter and 25 percent lighter than the OPUS 2 with a standard battery pack, so that it fits children's ears comfortably and safely. Adults can also appreciate a hearing solution small enough to be worn discreetly. 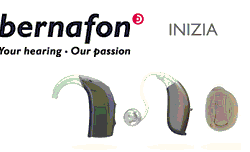 Derived from the Italian verb “iniziare” – which means to initiate something or to take first actions – Inizia embodies just that: the ideal start towards better hearing. Inizia is equipped with ChannelFree™ signal processing and advanced technology, and is accessible at an affordable price. With the new Inizia 3 Nano RITE, and three new Inizia 3 custom instrument styles, Inizia has a truly appealing product and style palette. With the addition of a full shell custom made instrument with directional microphones (ITED), and a small and powerful in-the-canal device (ITCP), more clients can benefit from Inizia’s advanced technology at an affordable price. The cosmetically appealing CIC, our smallest instrument, is also now available with more power (CICP).Here is a hearing instrument family with something for everyone and solutions for virtually any hearing loss.